This Is Where ALL Single Moms Can Feel Welcome – Enjoy Your Visit! Speak UP Enterprises and Creative Minds Publishing presents the 2nd edition of Robbie Butler’s comprehensive single-parent parenting manual, “Ms. 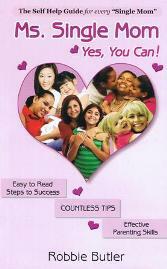 Single Mom – Yes, You Can!” This engaging Self Help Guide is practical and easy to read; it will help Single Moms (and many married moms) manage a situation that’s often overwhelming. Ms. Butler affirms that every woman raising children alone – if she’s never been married; is divorced; is widowed; is separated; or is a substitute for an absent mom – qualifies as a Single Mom. Regardless of the choice, circumstance, or consequence that qualifies her as a Single Mom; every Single Mom can now purchase her very own copy of this handy reference manual complete with real-life answers to those very hard real-life questions. African American Museum & Library at Oakland (AAMLO); African American Infant Health Program (AAIHP); Black Infant Health Program (BIH); Chatmon’s Books; Duke Ellington High School; El Camino College; Los Angeles County Library; Oakland Public Library; Options For Recovery, and Spelman College Bookstore. Purchase Now Order “Ms. Single Mom” for yourself; then purchase this book as a special gift for every Single Mom in your life… Yes, You Can! Join our mailing list today and always get the latest “Ms. Single Mom” news. Copyright © 2019 Ms. Single Mom.